Note: **Before you engage a mentor you must be an EFT Universe PRACTITIONER CANDIDATE. As a practitioner candidate, you have attended the required EFT workshops and we have your completed Certified EFT Practitioner Application form on file at EFT Universe. The process of mentorship is designed to support your professional growth, and identify and fill in evident gaps in your skill-set before completion of your EFT practitioner certification. 4. Practice Your New EFT Skills for (at least) 50 Sessions, and Fill Out the Individual Session Notes form (see below) for 47 of the Sessions and Submit this to Your Mentoring Consultant. Note: Multiple sessions with the same client count toward the total of 50 (e.g., 30 single session clients + 10 two-session clients (10x2=20) = 50 sessions). 5. Write up Detailed Case Histories for the Remaining 3 Client Interactions, using These Case Study Guidelines and Submit them to Your Mentoring Consultant. You do not have to wait until you have completed all of your client interactions to take the EFT exam. 6. Take and Pass the Online EFT Exam. Note: You will need to set up a EFT Universe Member Login at EFTUniverse.com to take the exam. When you purchase the exam, you will be prompted to create a site login if you have not already done so. Be sure to contact the support team at support(at)eftuniverse(dot)com when you create an EFTU login so the site admin can approve it. Otherwise, you can create an EFT Universe site login here: www.eftuniverse.com/create-an-account. You only need one login account for the entire site. DO NOT CREATE A 2ND LOGIN if you already have one from submitting documents to EFTUniverse.com. Please use one email for all of your interactions with EFT Universe and for your member login. 7. Submit Your Book Reports from the Required Reading List to Your Mentoring Consultant. 8. Spend 15 Hours Working with EFT on Your Own Personal Issues. Note: Keep a journal of your progress. You can use EFT plus another modality, such as cognitive therapy or mindfulness. Working with a coach or therapist is preferred. The specifics of this requirement are determined by your mentoring consultant, so please discuss them in advance. 9. Complete a 2 Day Practice Intensive Workshop. 10. Learn the Importance of Ethical Skills for EFT Practitioners. 2. 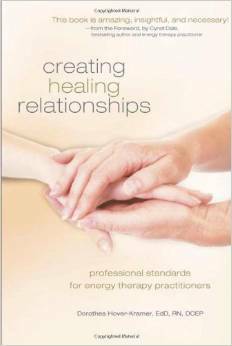 Creating Healing Relationships by Dorothea Hover-Kramer, EdD, DCEP. These two books contain important information towards helping you become an ethically-aware practitioner. 11. Take and Pass the Ethics Exam Here. Note: Do not take both the EFT Exam and the Ethics Exam on the same day. Note: Click here for a list of companies offering insurance to energy healing practitioners. Be sure to read all of the information on this page from the top to the bottom and realize that in order to be certified by EFT Universe you must list EFT Universe as an additional insured. USA candidates must list EFT Universe as an additional insured. Australian and Canadian Candidates must list EFT Universe as an Interested 3rd Party. 13. Sign the EFT Universe EFT Practitioner Certification Agreement. After we have reviewed the Practitioner Agreement and the Insurance Coverage Letter listing EFT Universe as an additional insured, you will receive an e-mail from the Certification Facilitator for the final steps below. 14. Pay Your Final Fee. Note: A link to pay your final fee will be provided by the EFT Universe Certification Facilitator once the above steps have been satisfactorily completed. 15. Receive Your Paper EFT Practitioner Certificate. Note: This is sent to you by postal mail once you have paid your final fees, all required documents have been approved by EFT Universe and the EFTU Certification Facilitator has assigned a certificate number and approved your certification. 16. Write up a Description of Your Services and Add Information to EFT Universe. Note: Once you have completed all the requirements to becoming a practitioner, the EFT Universe tech team will email you a "Please Read: Welcome to EFT Universe" email with instructions for updating your EFT Universe Practitioner Profile page in the EFT practitioner directory and information on when you can expect your paper cert. You will log in to EFT Universe and follow the instructions provided and upload your information to the EFT Universe certified EFT practitioner directory listing. * The first three steps above (Step 1, 2 and 3) must be followed in exact order. Your EFT Universe Practitioner Certification Application Form (see online form above) needs to be on file with EFT Universe BEFORE you engage a mentor. You should engage an mentor shortly after you send in the completed certification application with documents and fees. Remember, mentoring is based on feedback and you will want to make sure your beginning sessions of no more than 7 to 10 are evaluated by your mentor before you send in others. Typical time frames for completing Certified EFT Practitioner requirements range from 1 year to 18 months. However, those candidates who go beyond 2 years may be obligated to complete additional requirements (which may include repeat workshops or exams) as outlined by their mentor and EFT Universe. EFT Universe invests a great deal of time, expertise, and money into the EFT practitioner certification program in order to maintain a high standard of excellence. The costs of certification are kept as low as possible, consistent with the need to finance an excellent program. 1. Submit Application Fee: $300. This is a non-refundable fee. You can fill out the application form and make your payment here. 2. Complete a 4-5 Professional Workshop and a 2-day Practice Intensive Workshop. The EFT Workshops cost between $395 and $795; you can see the costs and schedule here. 3. Pass the Online Exam and the Ethics Exam. This Practitioner Exam and the Ethics Exam are administered by EFT Universe and cost $99 each. Do not take these exams on the same day. 4. Complete 15 hours of Your Personal Psychological and Spiritual Growth Work with EFT. The specifics of this requirement are determined by your mentoring consultant, so please discuss them in advance. 5. Have Your Cases Reviewed by Your Mentoring Consultant. The current rate for mentoring consultants is $700 for regular certification and $900 for Expert. These fees are paid directly to your mentoring consultant. If you require additional services from your mentor, they will bill these to you at their hourly rate. 6. Purchase the Books for Required Reading, about $150. 7. Register as a Certified EFT Practitioner: $415 (AKA "Final Fee"). The total of the above costs is about $3,500 - $4,000. Once you're certified and your EFT practitioner profile is placed on the EFT Universe website, which receives over a million page views a year, you are likely to receive an ongoing stream of referrals. 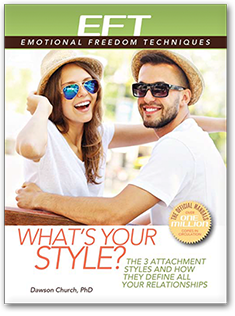 If you write articles for EFTUniverse.com and they are featured in the EFT Peak Insights weekly newsletter, you become more visible and you will find more clients coming to you through the EFT Universe website or to your own professional website through your EFT Universe practitioner profile page. The newsletter goes out to over 100K subscribers each week. EFT Universe also has a popular Facebook Page where EFT articles by EFT practitioners are shared with the public. 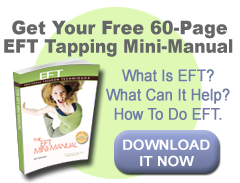 ~ For steps to becoming an Expert EFT practitioner, click here. Please note that prices, shown on this website are subject to change without notice. 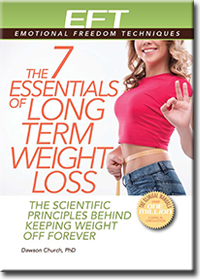 While every effort is made to keep prices accurate and up-to-date, ANY price shown on this website for EFT Certification are subject to change at any time without notice at the discretion of EFT Universe.